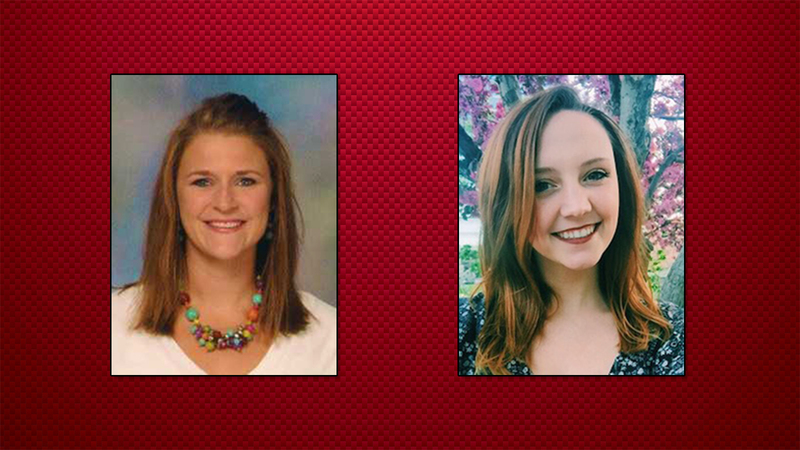 Holli Luff, a master’s student in the University of Nebraska-Lincoln’s Department of Special Education and Communication Disorders, and Carady Holguin, who completed her graduate certificate in sensory disabilities at Nebraska, were each recently selected for national awards. Luff received a Delta Gamma Foundation Graduate Student Fellowship Award to attend the 2019 American Foundation for the Blind (AFB) Leadership Conference Feb. 28-March 1 at the Crystal Gateway Marriott in Arlington, Virginia. Meanwhile, Holguin was selected as the Council for Exceptional Children (CEC) Division on Visual Impairments and Deafblindness (DVIDB) 2019 Teacher of the Year Award winner. Both students were mentored by Mackenzie Savaiano, an assistant professor of practice and coordinator of Nebraska’s graduate program in visual impairments. As a Delta Gamma Foundation Fellow, Luff will receive conference registration and up to three nights at the conference hotel, as well as a travel reimbursement of up to $500. She will be honored at a luncheon during the conference as well. Holguin, a Teacher for Students with Visual Impairments in Garden City, Kansas, will be recognized with the CEC-DVIDB 2019 Teacher of the Year Award at the annual CEC Convention & Expo Jan. 29-Feb. 2, 2019, in Indianapolis. The award honors a person who is exceptionally dedicated, knowledgeable and a skilled certified Teacher of Students with Visual Impairments or Certified Orientation and Mobility Specialist in any state approved or accredited day or specialized school, who serves students who are visually impaired, ages birth through 21, with or without additional disabilities. Holguin described the ways her experience in Nebraska’s visual impairments program impacted her teaching career, particularly through the support of the faculty, both while she was pursuing her graduate certificate and after she had finished. Luff, who earned her bachelor’s degrees in elementary education and special education from Nebraska and is now pursuing her master’s in special education, said her interest in working with individuals with visual impairments began shortly after high school and was cultivated throughout her undergraduate experience.